Barrel Vault Archtecture: Where & How were Barrel Vaults used? A vault is an arched brick or stone ceiling or roof of a building. A barrel vault is a type of vault with continuous arched surface, resembling the inside of a barrel or tunnel. Also known as a tunnel vault, the barrel vault is constructed by elongating the single semi-cylindrical curve of a convention vault to form a tunnel shaped structure. A barrel vault is the simplest form of vault. Technically, a barrel vault is formed when the arches of several conventional vaults are placed side by side, one after the other. Barrel vaults have been extensively used in ancient times, especially in Egyptian and Roman Architecture. During the Roman era, Barrel vaults were an integral part of the construction of churches and cathedrals. Barrel vaults were generally used for roofing purpose as they allowed large interior spaces. However, they also helped in forming long hallways, sewers, halls, and cellars. In Early Roman churches, roofs were generally made of stones or wood. However, wooden roofs often used to catch fire, bringing down the whole church structure. This was the main reason barrel vaults were extensively used. However, in order to build them, the walls needed to be extremely thick and devoid of any kind of apertures. This made the construction process extremely difficult, presenting a need to develop another way for constructing roofs. One problem with barrel vault construction was the generation of pressure on the lower parts of the vaults and walls. 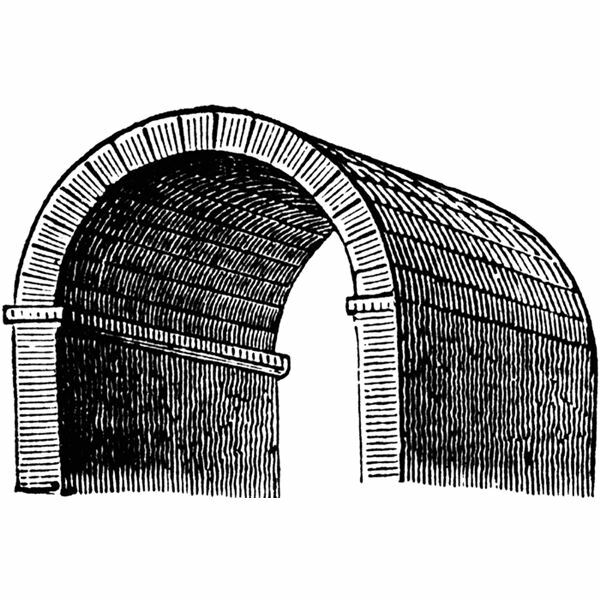 Due the heavy semi-circular arch, an outward force is created in the lower portions which lead to the collapse of the vault. For this reason, additional strength is provided to the walls in the form of side anchors or making parallel walls that would share the stress. Initially, thicker walls were made in order to absorb the load. However, as the length of vaults increased the method became less beneficial. 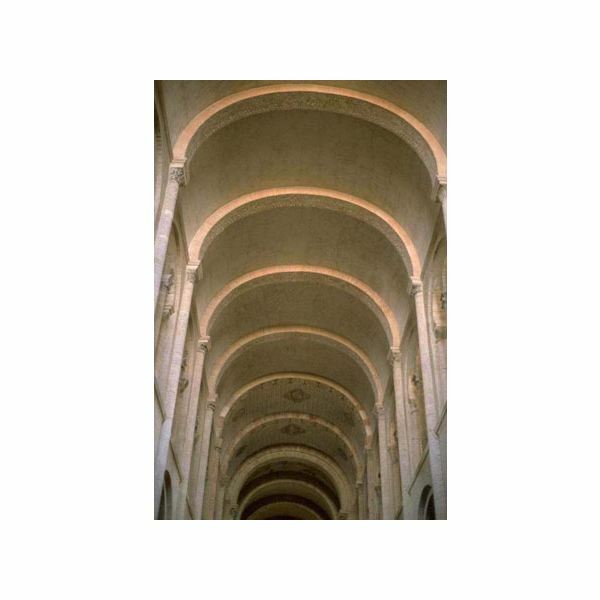 Another method to prevent this situation was to make barrel vaults parallel to each other, which would negate the outward stresses generated by each other. This method was a success; however even for this, the outermost walls needed to be extremely strong. Thus, a special kind of design was made wherein two barrel vaults would intersect each other at right angles, negating the lateral stress generated. This type of vault is known as groin vault. As the walls of barrel vaults are structurally weak, not even the smallest of holes for windows or decoration can be made out in it. 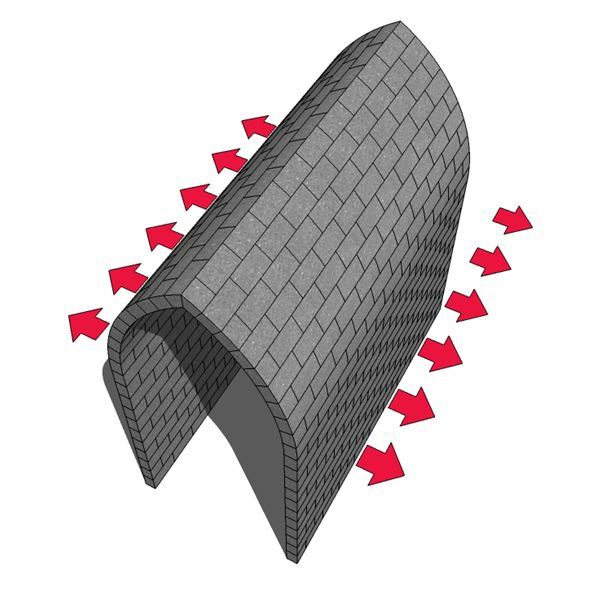 One more disadvantage of barrel vault is that it forms a series of continuous arches which are most of the time so deep that they cover a three-dimensional space. This makes the interior of the structures extremely dark as they provide very little intrusion for light. For this reason groin vaults were used wherever light was needed into the building. Thus, though barrel vaults introduced the usage of vaults in building structures, they had many drawbacks. However, they have great aesthetic appeal and are still used today in buildings around the world. Most of today’s barrel vaults are made from concrete and have metal framing.